American Fence Company started out as two men, a wheelbarrow, a truck and two augers American Fence Company over fifty years ago. Our outfit quickly grew to a full-fledged fence company complete with materials and fence installation. American Fence Company has thrived under this strategy and we have built 9 branches that serve 13 states. We just opened our most recent branch in Sioux City, Iowa in the beginning of 2019. 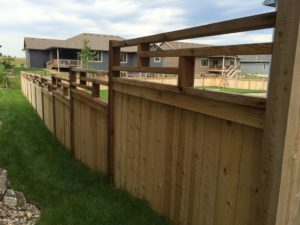 If you live close to Sioux City but aren’t within the city limits—or maybe not even in the same state—and you are interested in having American Fence Company of Sioux City install your fence, don’t worry. Not only does this branch serve Sioux City, but the surrounding area and towns as well. The new Sioux City branch proudly serves North Sioux City, Sergeant Bluff, Moville, Merril, Oto, Sloan, Akron, Anthon, Whiting, Le Mars, Kingsley, Mapleton, Holstein, Correctionville, Vermillion, Gayville, Elk Point, Emerson, Winnebago, Walthill, Macy, Wakefield, Pender, Decatur, Wayne, Martinburg and Obert. American Fence Company proudly offers free estimates for residential, commercial and industrial fence installation. To get your own free estimate, simply stop in to our branch, submit an online request or give us a call at 712-454-7732. Tell our experienced estimators all about your project’s specific needs and they will help you find the best fencing solutions for you.